TOKYO -- Most of the quarter-million people who fled massive flooding in southwest Japan were able to return home by Monday, but the danger had not fully passed from record rains that have killed at least 28 people. Thousands of homes and hundreds of roads were damaged, and hundreds of landslides were reported. The military airlifted food by helicopter to stranded districts. The rain "was like a waterfall," Yoko Yoshika said in Yamaguchi prefecture (state). "It was horrible." Yoshika, wife of an award-winning Hagi-yaki style potter, said workers used a bucket relay with plastic pails to get rid of the water flowing into their shop. 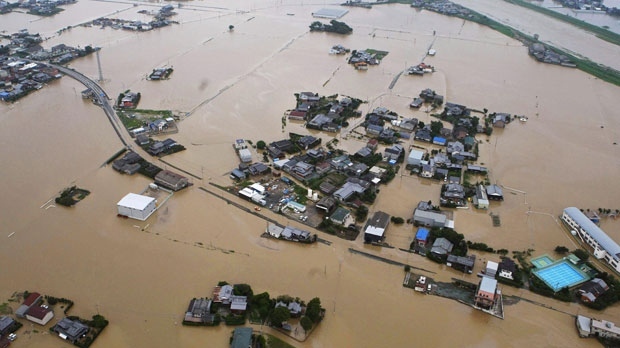 In Yame, a city of 69,000 in Fukuoka prefecture, dozens of people were stranded by the flooding. "Our region gets hit with heavy rain every year, but I have never experienced anything like this," city employee Kumi Takesue said. "Rice paddies and roads all became water so you couldn't tell what was what," she said, adding that she had to wade in knee-high water, even near her home, which was not as hard hit as other areas. Kyodo News service said 28 people have died and police were searching for four missing people in the three prefectures of Kumamoto, Oita and Fukuoka, from the heavy rainfall that began Thursday. Nationwide tallies of the dead and missing were not immediately available. Weather officials warned people to be careful even in areas where rain had subsided because the land was still mushy and prone to landslides. More rain was possible later Monday. Even as some of the water subsided, homes and farms on the southern island of Kyushu, hardest hit by the flooding, were still getting food shipments, although mostly by land, local officials said. The intense rain occurred as far north as the ancient capital of Kyoto, where rainfall exceeded 3.5 inches per hour -- a condition in which rain cascades in such torrents that seeing ahead becomes impossible. Evacuation orders were gradually being lifted, allowing most residents to return home by late Sunday. 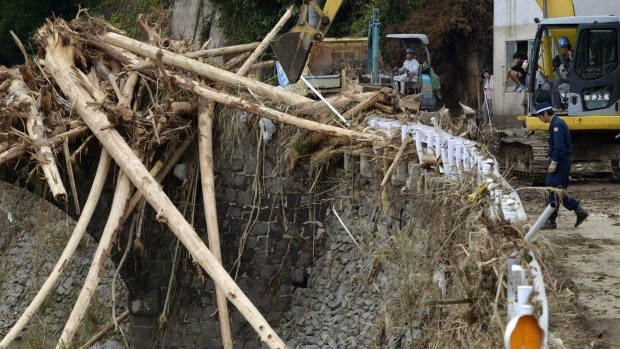 Fukuoka prefecture said that as of Monday, damage there extended to more than 4,300 homes, 800 roads and 20 bridges. At least 518 landslides were recorded, and more than 2,700 people had evacuated their homes, it said in a statement.